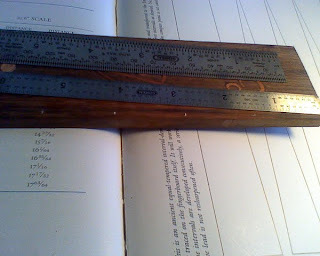 I had to get a ruler that measured to the 64th of an inch to do this task. 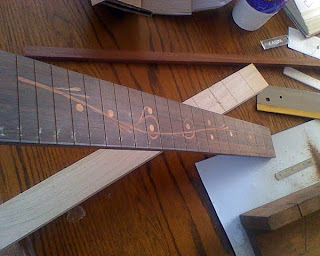 I used an exacto knife to cut the marks in the board and filled the mark with a white crayon – So I could see exactly where I need to cut the fret-slots. Then I needed to make a new 90° cut in my old rock maple miter jig. 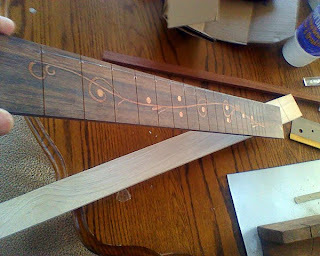 The top bar on the blade worked out to stop the saw from cutting too deep in the fretboard. I was very careful to measure correctly and I even used a light to guide me – cutting perfectly on the mark. This light was clamped to the clamp that held the miter box down and swung out of the way for cutting – worked great. But the lamp was very hot and uncomfortable to work near. 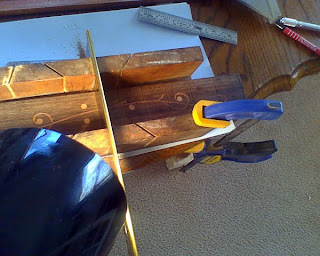 Completed sawing the slots in the fret board. You can see my practice board in the background. 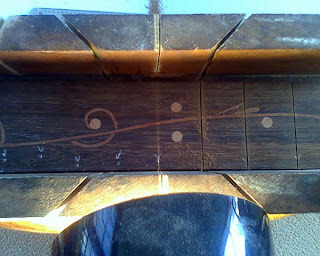 Just another photo showing the top of the fretboard. I'm pretty happy how this turned out. But I did take my time to do it right. Dude, this is so awesome!! I had no idea you were such a skilled woodworker. How sweet it will be to play an instrument you built.